The average U.S. taxpayer pays more to private military contractors than funds that directly support the troops. 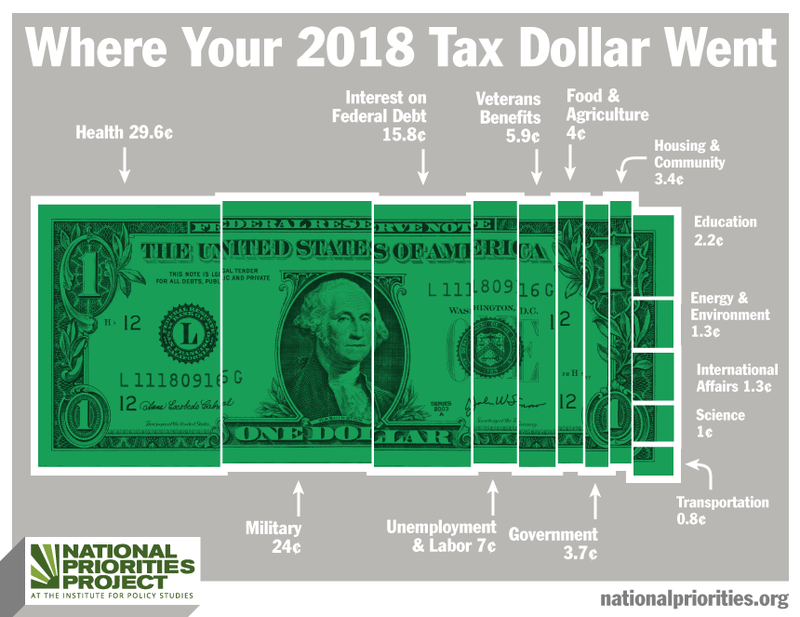 Of every dollar taxpayers pay in income taxes, 24¢ goes to the military – but only 4.8¢ goes to our troops in the form of pay, housing allowances and other benefits (excluding healthcare). Out of the 24¢ on the dollar that taxpayers contribute to military spending, 12¢ goes to military contractors. Taxpayers pay half as much to support our veterans by providing health care, income support and job training, among other benefits (5.9¢) as we pay private military contractors. 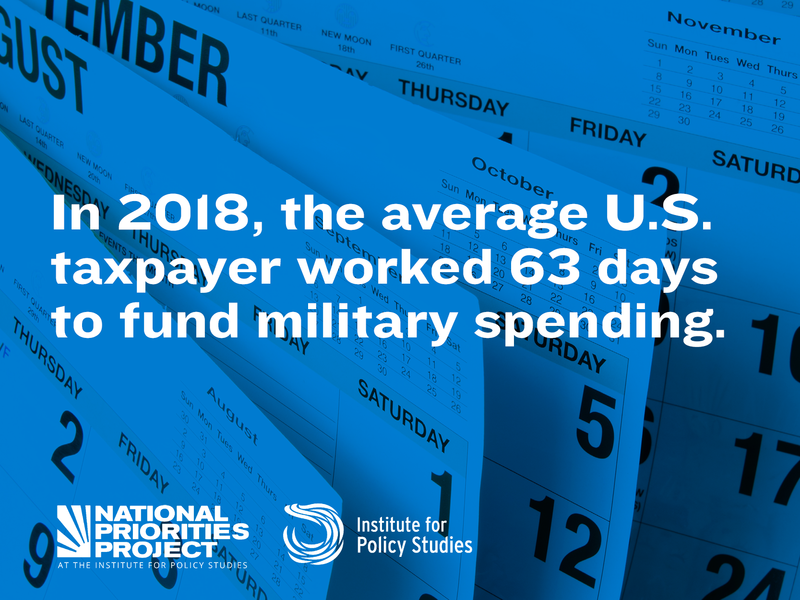 The average U.S. taxpayer worked 63 days last year to fund military spending. Only 13 directly supported the troops, while 31 directly supported private contractors: four of those days went to Lockheed Martin, and two went to Boeing. The average taxpayer contributed $230 to Lockheed Martin’s Department of Defense contracts, the Pentagon’s biggest contractor and maker of the ill-conceived F-35 jet fighter. That’s twice as much as the $109 taxpayers contributed to child nutrition programs like school breakfast and lunch. The average taxpayer contributed $102 for Department of Defense contracts for Boeing – whose former executive Patrick Shanahan is now the acting U.S. Secretary of Defense. The average taxpayer paid $3,457 for the Pentagon and military, almost nineteen times more than for all diplomacy and foreign aid ($183). The U.S. spends more on proliferating weapons of mass destruction than we do on foreign aid and diplomacy, the EPA, or CHIP. 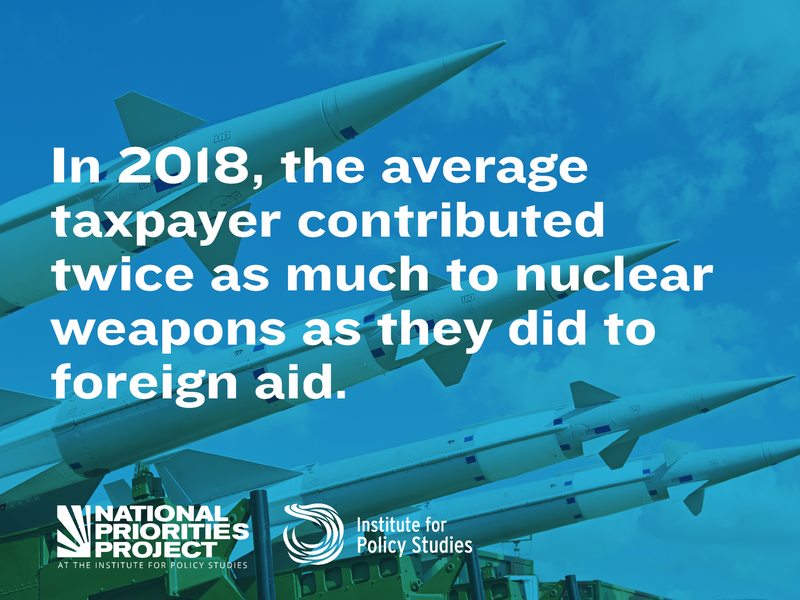 Out of every tax dollar, 0.7¢ goes to nuclear weapons — that’s $100 for the average taxpayer. 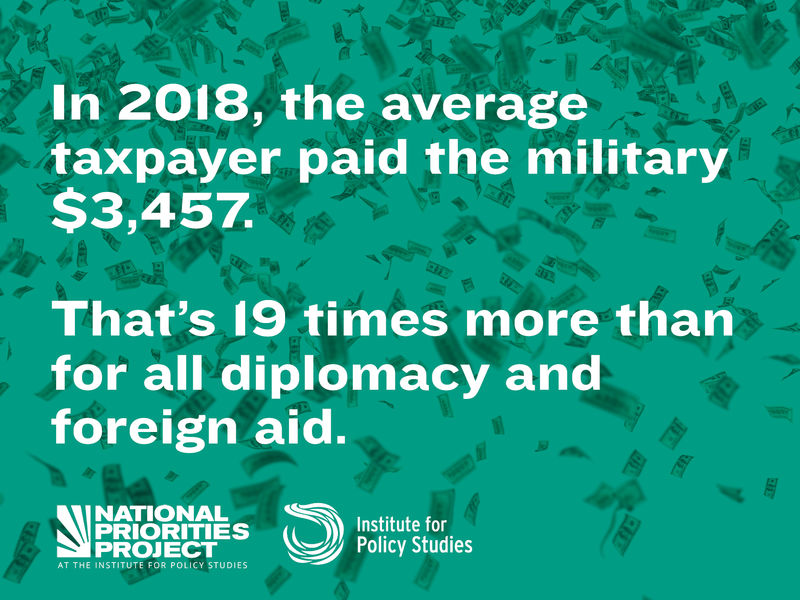 That’s almost as much as we spend on the State Department, our government’s main instrument of foreign diplomacy (0.9¢ on the dollar, or $123 from the average taxpayer). just about as much as we spend on K-12 education (0.7¢ on the dollar, $101 from the average taxpayer). The U.S. government spend as much taxpayer money separating families as it does on K-12 education. The average taxpayer paid the same amount ($101) for K-12 education as they did for Immigration and Customs Enforcement (ICE) and Customs and Border Patrol, including family separations. The average taxpayer paid $219 for college financial aid, less than they paid to Department of Defense contractor Lockheed Martin. This is the taxpayer’s biggest tab, with Medicare and Medicaid providing health care for 1 in 3 people in the U.S.
Out of every tax dollar, 29.6¢ goes to health care, including $12.9 cents for Medicaid and $11.4 cents for Medicare. The Children’s Health Insurance Program, which provides insurance for more than 9 million low-income and poor children, costs just 0.6¢ out of every tax dollar. Together, Medicare and Medicaid programs provide health care for one in three Americans. Medicaid has been shown to be more cost effective than private insurance. The National Institutes of Health, which funds federal medical research into cancer, the opioid epidemic, Alzheimer’s disease, influenza and more accounts for just 1.1¢ of every tax dollar. 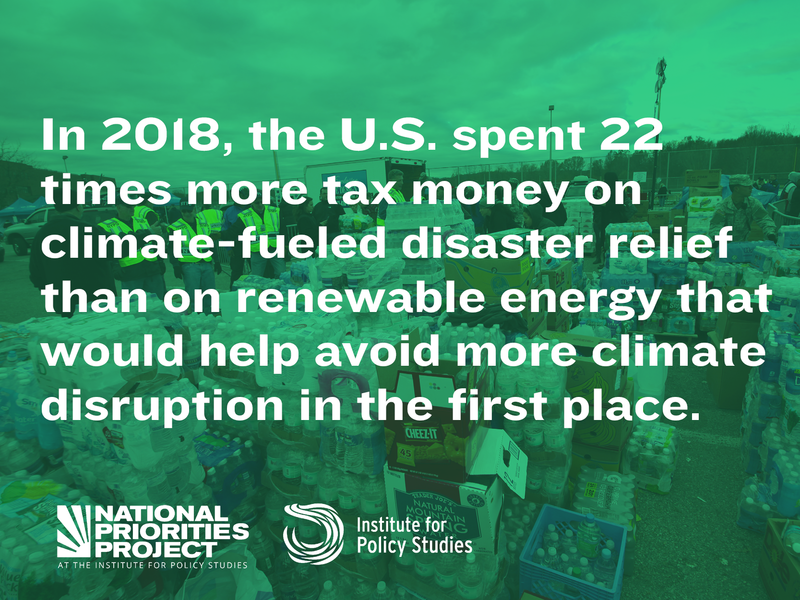 Many more of your tax dollars go to disaster relief than to investments in renewable energy that could help slow the damage caused by climate change. The average taxpayer contributed just $38 for the Environmental Protection Agency, which has been threatened with a 31% budget cut (to $6.1 billion) under President Trump’s proposed 2020 budget. That’s just 0.3¢ out of every taxpayer dollar last year for the EPA, in the face of rapidly accelerating climate change and the proliferation of unsafe drinking water in thousands of communities across the country. 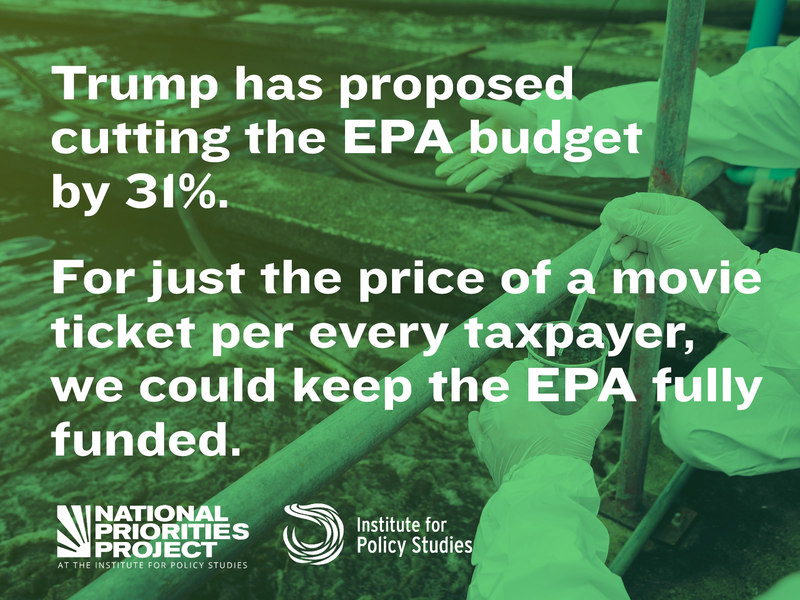 Keeping the EPA fully funded would cost just $11.63 for the average taxpayer, to help ensure clean air and drinking water, clean up toxic Superfund sites, and keep lead and other dangerous substances out of our environment. When it comes to climate change, we are funding crisis response at the expense of crisis prevention. The average taxpayer paid $179 to deal with the aftermath of natural disasters fueled by climate change (flood insurance ($33) + wildfire management ($22) + disaster relief ($124)) — that’s 22 times as much they spent to support the shift from fossil fuels to renewable energy ($8). In the age of growing income inequality, the average taxpayer contributes more to private DoD contractors than to labor and unemployment programs. The average taxpayer pays $30 to house the homeless and $10 on public housing, but $33 to support federal prisons. 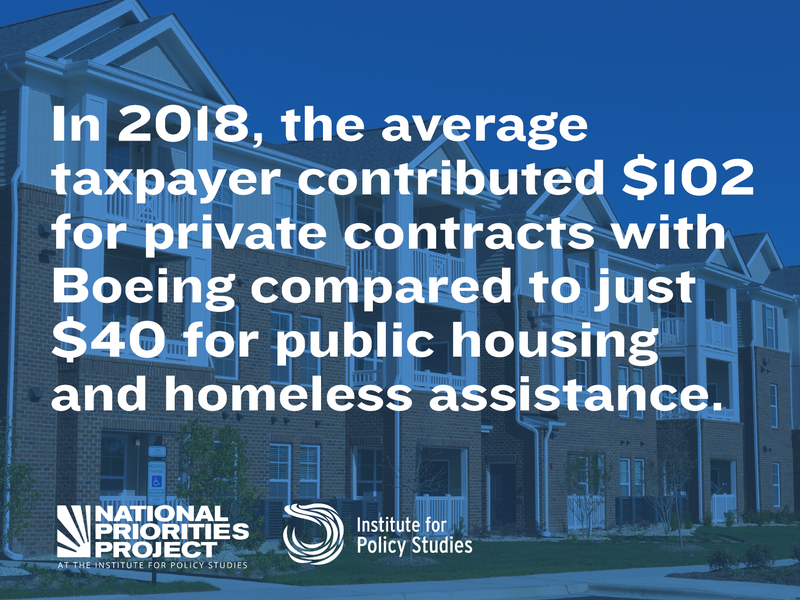 The average taxpayer contributes just $10 for public housing, $16 for heating assistance for low-income and poor people, and $78 to Temporary Assistance for Needy Families (welfare). Altogether, the average taxpayer contributed about as much to those programs as to the $102 they paid in Department of Defense contracts for Boeing, whose former executive Patrick Shanahan is now acting Secretary of Defense. The average taxpayer contributed $326 to SNAP (food stamps). About one in eight Americans, or 40 million people in all 50 states and across all races, depended on SNAP benefits in 2018. In an age of growing income inequality, the average taxpayer contributed $1,010 to labor and unemployment programs like the Earned Income Tax Credit ($279), which returns money to low-income working people, Temporary Assistance to Needy Families ($78), and heating assistance for low-income families ($16), but paid $1,735 to private contractors for the Department of Defense. A full tax day report, with tools to calculate your personal or state tax receipt, will be available at https://ips-dc.org/tax-day-2019/ on April 12, 2019. An interactive tax receipt that allows users to plug in their actual taxes paid, or to see an average for their state, will be available at https://www.nationalpriorities.org/interactive-data/taxday/ on April 12, 2019. This research was produced by Lindsay Koshgarian and Ashik Siddique of the National Priorities Project at the Institute for Policy Studies. To get in touch with them, or for any questions, please contact Domenica Ghanem at domenica@ips-dc.org, or 202-787-5205.